It's not often easy for line-of-business managers to get a real-time view of their budgets and spending, but a new app from SAP aims to change that. Based on SAP's Hana Cloud Platform, the app pulls data from core financial reporting systems and makes it searchable, so that line managers can do ad hoc spend analyses and other on-the-fly calculations. 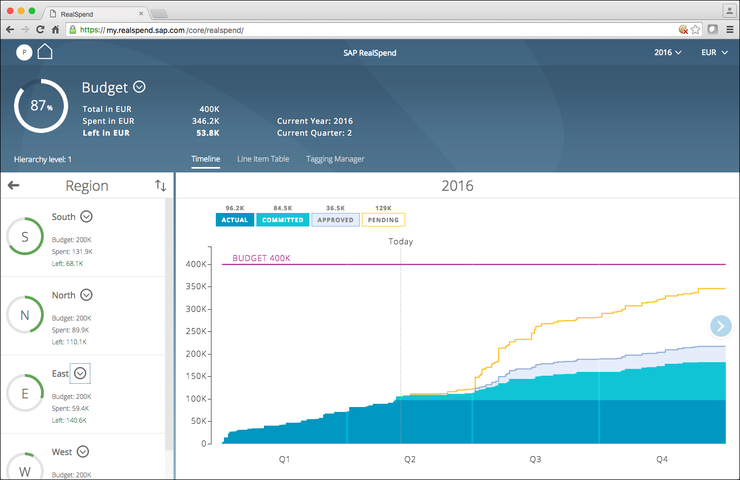 Called SAP RealSpend, the app lets managers drill down and perform a fine-grained analysis of actual and future spending. It can also deliver related forecast and budget plans. One key feature provides an overview of expenses by categories such as accounts, cost centers and internal orders. Another allows managers to enrich booked data from an ERP system with planned and committed expenses, giving them quick insight into whether they're operating within their budget. Managers can simulate the budgetary influence of decisions including sales, marketing, travel, hiring and equipment investments. The goal is to help users manage their spending more proactively. The app is one of the first to connect to the SAP S/4Hana Finance product in real time, without having to replicate data. RealSpend also works with other data from SAP and third-party sources.